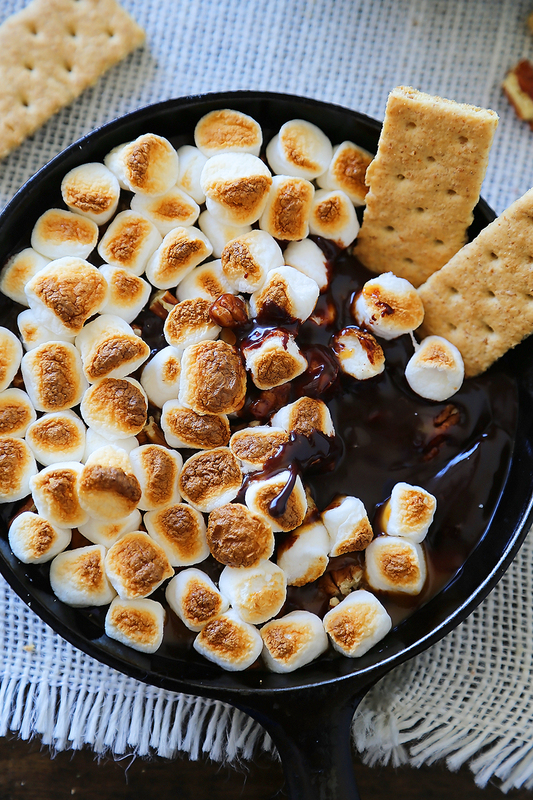 Dig in to the warm and gooey deliciousness of this 5-ingredient skillet s’mores dip. 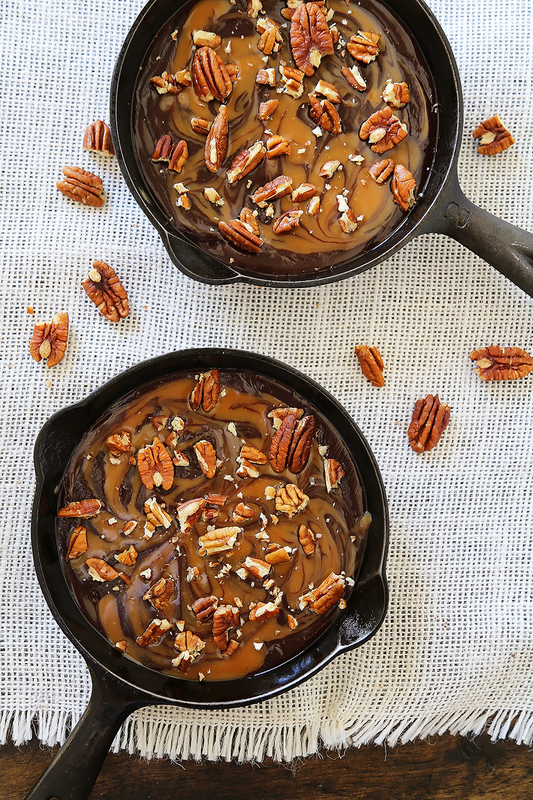 Loaded with creamy caramel and pecans, and super quick and easy! Perfect for an anytime treat and last-minute guests. No campfire required! When I first met my Southern gentleman, now fiancé, we were intent on spoiling each other with food. Specifically, the summer of 2015 saw our new relationship blossom around a string of never-ending home cooked meals. There was sizzled pork belly, braised veal osso bucco, melt-in-your-mouth short ribs, buttery lobster tails, and oh dear. The desserts! Flambéed bananas over vanilla bean ice cream comes to mind. And coconut cookies, and pecan pies, and little layer cakes for our birthdays. I didn’t want to come up for air! It wasn’t about impressing each other, as much as it was about just enjoying the good life. Delicious food made by two people who love to cook, and happened to find each other at the right moment. Plain and simple, good old-fashioned courtship was cookin’. And it was a time of belly, heart-filling goodness. However, months later when he returned to his teaching hours, we realized we had to make our elegant weeknight meals and desserts much easier. That is, simpler, but still scrumptious and full of love. When we started to make our meals smaller and more weeknight-friendly, the desserts were reigned back a bit, too. But, that doesn’t mean we’ve given up the occasional sweet treat! 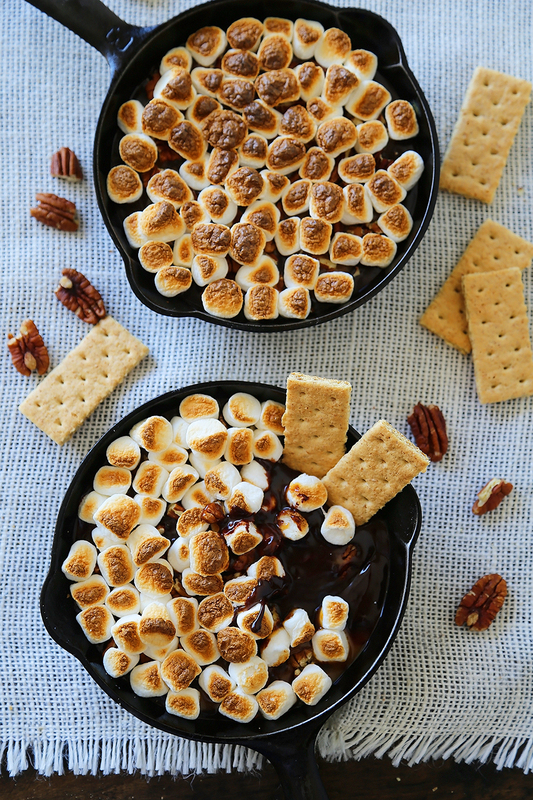 This s’mores dip has become our latest guilty pleasure, and it is sinfully easy! Want to make yours? Keep reading! 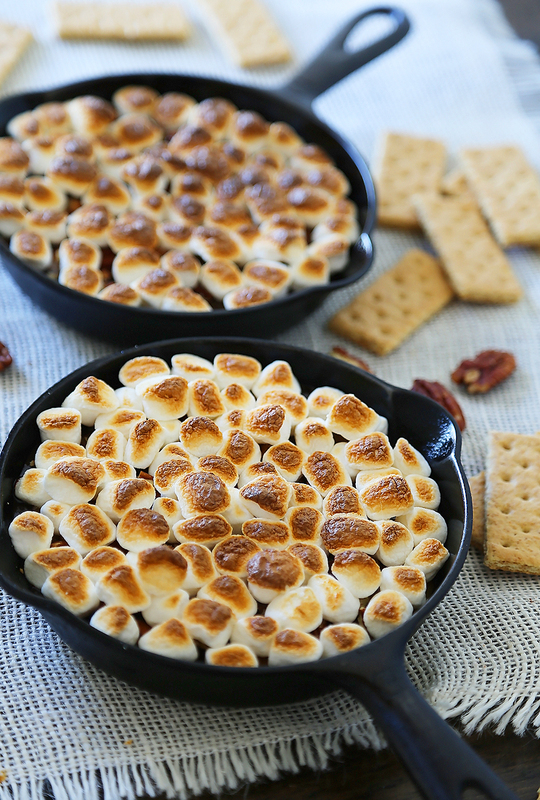 All you need are five ingredients, plus graham crackers, for these mini s’mores skillet dips! You can make yours mini, or make them in a medium (9-inch-ish) skillet, or even a baking dish. However, I think smaller is better for these delicious dips! 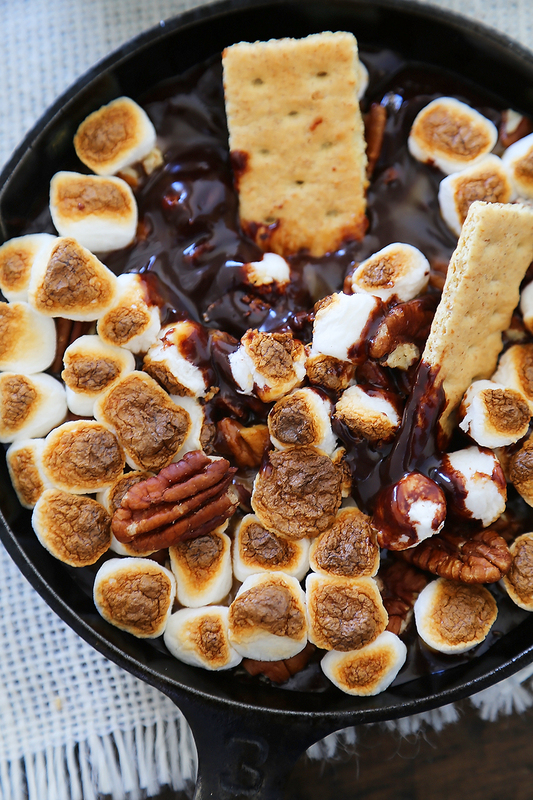 That way, if you have a crowd of hungry chocolate lovers scooping away, everyone doesn’t have to share the same skillet or dish. Dig me? Simply combine chocolate and milk in one pot, and caramel and milk in another. Slowly melt them separately, for about 7-9 minutes, stirring until each is smooth and creamy. Add a little more milk, if necessary, to thin the chocolate to a syrup-like consistency. 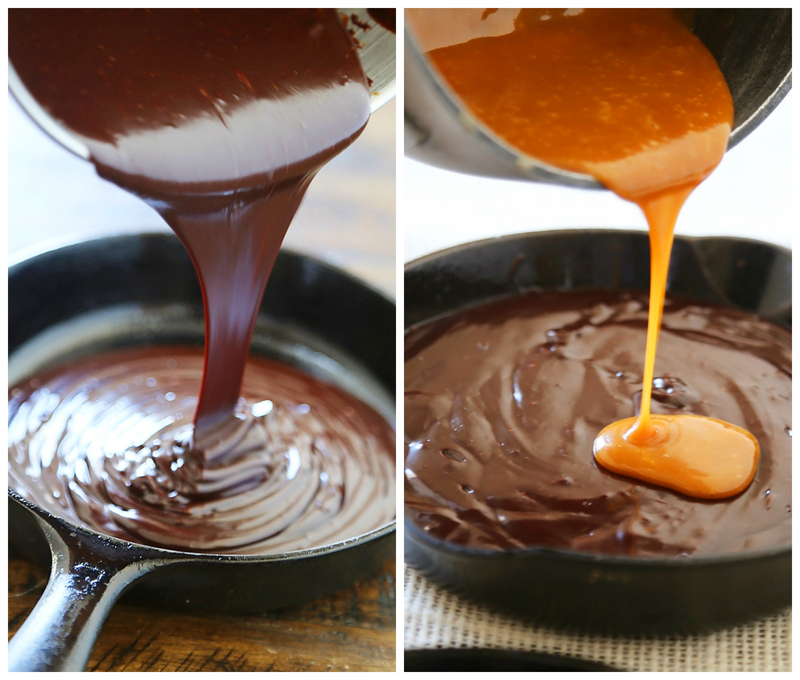 Pour the chocolate into your skillet, then the caramel on top. It’s fun to swirl these together with a skewer or blunt knife, too! Crumble a handful of pecans on top, or you can leave these out if you prefer. Then, heap on the marshmallows as heavy or light as you like. 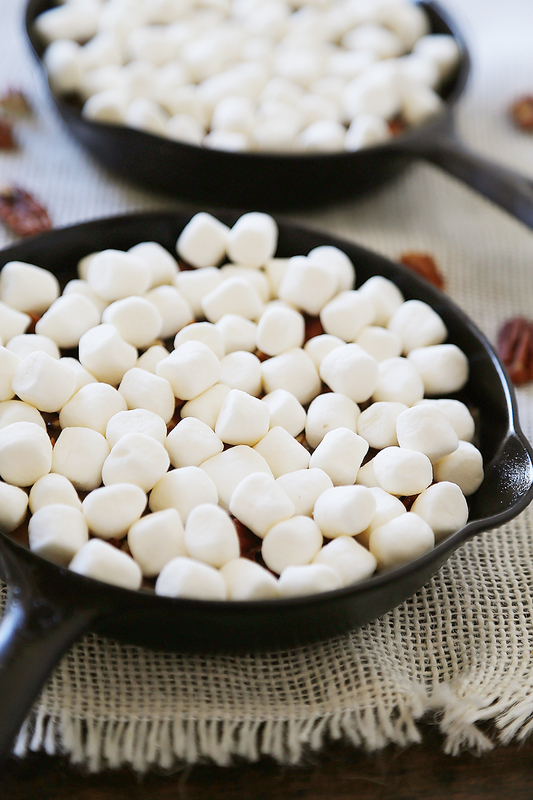 Pop your skillet under a hot broiler, and watch carefully to avoid the marshmallows setting ablaze. It can happen quickly! If you’re doing two skillets or dishes, it might be best to do them one-at-a-time. That way, if one burns, you have a spare! And it’s always good to keep a spare s’more. These are terrific fun for kids to help with, and my toddler really enjoyed getting in the action! She loved helping pour the chocolate and sprinkling on the marshmallows. Just remember to keep their little hands away from the hot pots of melting chocolate and caramel, and the broiler. 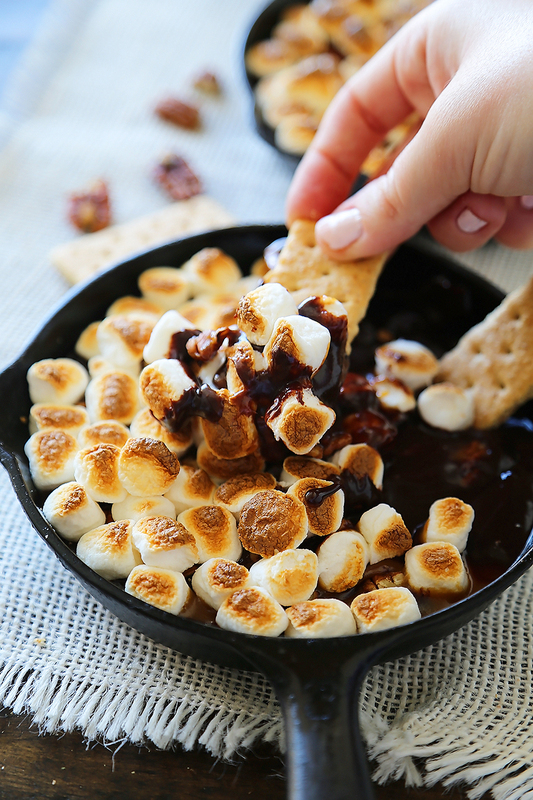 I know you, and whomever is lucky enough to share with you, will flip for these ooey-gooey s’mores dips. They are a totally delicious and unique way to enjoy that classic campfire treat easily at home! In a medium pot set to medium-low heat, combine chocolate chips and 1/4 cup milk. Stir until melted and smooth. Remove from heat. In a separate medium pot set to medium-low, combine caramels with remaining 2 Tbsp. milk. Stir until melted and smooth. 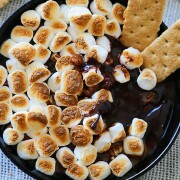 Pour melted chocolate into an oven-safe dish or skillet. Pour melted caramel over top. 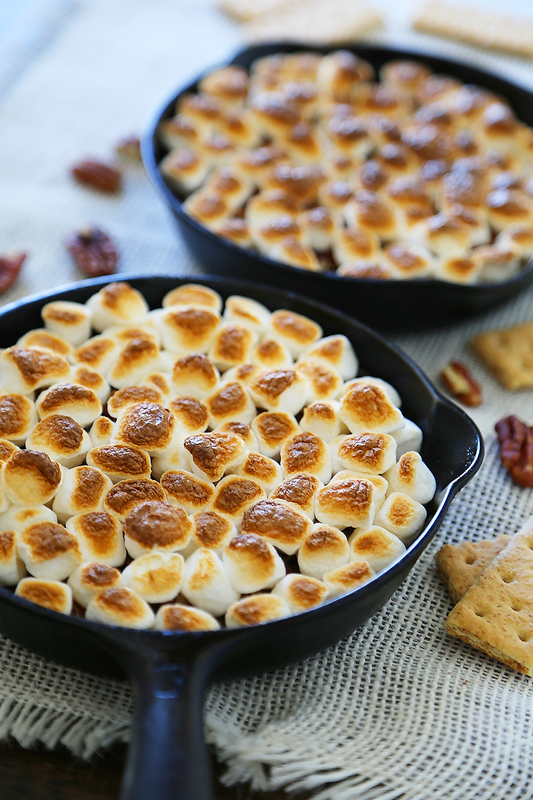 Top with pecan pieces and mini marshmallows. Preheat your broiler. Broil for up to 1 minute, just until marshmallows are lightly toasted. Watch carefully to avoid burning marshmallows. Serve warm, with graham crackers for dipping. Very interesting this article. Thanks a lot for sharing. The post of the best! This article was quite good and recipes looks too yummy. If the insurance agent or counselor tries to persuade you that the scores of your business are not significant, they may be lying down for your needs. If this happens, you are able to file a issue with the state’s insurance division. If you think you can not have confidence in somebody, discover one more company to use. Have you been having a slug problem in your backyard or garden? A fairly easy correct for this particular concern is just to location a pie dish of stale beer throughout the garden. The slugs enjoy this and definately will crawl in and drown in the stale beer. It is really an simple and easy affordable correct to your irritating slug issue. An important idea to take into consideration when concerning zits lying on your back is to use as numerous pure cotton clothes items as is possible, especially for any type of exercising. This will be helpful since cotton is certainly a breathable cloth that can promote the water loss of perspire and removal of skin oils and dirt from the epidermis. You should learn to utilize your apple iphone to have instructions to everywhere that you would like to visit. You simply need the map’s program, and you can select your destination and beginning point to get the guidelines that you need. It is very easy and is virtually always proper. Studying this information So i am happy to convey that I’ve an incredibly excellent uncanny feeling I came upon exactly what I needed. wonderful issues altogether, you simply gained a emblem new reader. What may you suggest about your submit that you made some days in the past? Any certain? Greetings from Idaho! I’m bored at work so I decided to browse your website on my iphone during lunch break. I enjoy the information you provide here and can’t wait to take a look when I get home. I’m shocked at how quick your blog loaded on my mobile .. I’m not even using WIFI, just 3G .. Anyhow, wonderful blog! Hey would you mind letting me know which hosting company you’re utilizing? I’ve loaded your blog in 3 completely different internet browsers and I must say this blog loads a lot quicker then most. Can you recommend a good web hosting provider at a reasonable price? Many thanks, I appreciate it! Pretty nice post. I simply stumbled upon your weblog and wanted to mention that I’ve truly enjoyed surfing around your blog posts. After all Il be subscribing on your rss feed and I am hoping you write again very soon! I am really loving the theme/design of your web site. Do you ever run into any internet browser compatibility problems? A few of my blog readers have complained about my website not working correctly in Explorer but looks great in Safari. Do you have any suggestions to help fix this issue? Ie been exploring for a little bit for any high quality articles or blog posts on this sort of area . Exploring in Yahoo I at last stumbled upon this site. Reading this information So i am happy to convey that I have an incredibly good uncanny feeling I discovered exactly what I needed. I most certainly will make sure to do not forget this website and give it a glance regularly. My programmer is trying to persuade me to move to .net from PHP. I have always disliked the idea because of the costs. But he’s tryiong none the less. I’ve been using WordPress on numerous websites for about a year and am worried about switching to another platform. I have heard very good things about blogengine.net. Is there a way I can import all my wordpress content into it? Any help would be really appreciated! Excellent items from you, man. I have take note your stuff previous to and you are just extremely fantastic. I actually like what you have acquired here, certainly like what you are stating and the way wherein you assert it. You make it entertaining and you continue to care for to keep it wise. I can not wait to learn much more from you. This is actually a terrific site. The crux of your writing whilst appearing agreeable initially, did not really sit properly with me after some time. Somewhere throughout the sentences you actually were able to make me a believer unfortunately only for a short while. I still have got a problem with your jumps in logic and one would do well to fill in all those breaks. If you can accomplish that, I could undoubtedly end up being impressed. Il immediately seize your rss as I can’t in finding your email subscription link or newsletter service. Do you have any? Kindly allow me understand in order that I may just subscribe. Thanks. Hi there, just become alert to your weblog via Google, and located that it is really informative. I going to be careful for brussels. Il be grateful if you happen to proceed this in future. A lot of other people will be benefited from your writing. Cheers! I like the valuable information you provide in your articles. Il bookmark your blog and check again here frequently. I am quite sure Il learn many new stuff right here! Best of luck for the next! What i don’t understood is actually how you’re not actually much more well-liked than you may be now. You are so intelligent. You realize therefore significantly relating to this subject, produced me personally consider it from numerous varied angles. Its like women and men aren’t fascinated unless it is one thing to accomplish with Lady gaga! Your own stuffs outstanding. Always maintain it up! This web site is really a walk-by means of for all the information you wanted about this and didn know who to ask. Glimpse here, and youl positively discover it. I must show some thanks to the writer just for rescuing me from this difficulty. Just after checking through the world-wide-web and getting ideas which are not productive, I thought my life was done. Existing without the presence of strategies to the problems you have solved by way of this article content is a serious case, as well as ones that could have negatively damaged my career if I hadn’t noticed your blog. Your main natural talent and kindness in touching the whole lot was very helpful. I’m not sure what I would have done if I had not discovered such a step like this. I’m able to at this moment look forward to my future. Thanks a lot very much for the high quality and results-oriented guide. I won’t hesitate to refer your web site to anyone who will need care on this subject matter. attempting to find things to enhance my website!I assume its ok to use some of your ideas!! Never ever take too lightly the part of diet plan, physical exercise, and great rest in staving away despression symptoms. Should you be feeling stressed out, a quick fix may be a go swimming, bicycle drive, work or brisk stroll. In the long term, preventing refined food, receiving simple exercises everyday, and simply being certain to get 8 hrs of excellent sleep at night each night may possibly forever run after out your blues. Exercise is an important element of education your dog. Your dog that lacks ample workout could have higher numbers of power. This vitality will come out as chewing on issues, having fun with folks, working around the house, or some other unwanted actions. Exercising will assist a single use a workable canine to use.